Arsenal pay twice as much as Chelsea fans for each goal scored! There are numerous complaints from Arsenal fans that we have the most expensive season-ticket prices in the world, but we never ever come close to wining the Premier League, or even compete with other big clubs for superstar signings. Now the fans have something else to moan about! 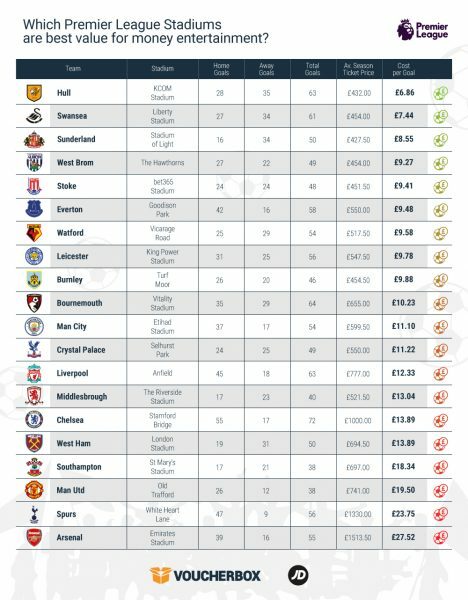 Voucherbox have analyzed the average price per season ticket compared to the goals scored by both sides in home games, and worked out a ‘price per goal’ infographic – which you can see below. Hull fans may be peeved at getting relegated, but at least they only had to pay 6.86 for each of the goals scored at the KC Stadium, while Swansea and Sunderland are next best value in England. As for London clubs, Watford are great value at just 9.58 per goal, while Chelsea and West Ham pay an average of 13.89, but the Top Two expensive clubs are Tottenham at 23.75 and, inevitably, Arsenal are well clear at a price of 27.52 from each fan at the Emirates. That is just about double what West Ham and Chelsea fans pay…. In comparison with the Bundesliga, Bayern Munich fans pay just 7.58 per goal, which is less that Sunderland fans pay! This entry was posted in Arsenal News, Arsenal NewsNow on June 17, 2017 by Admin. What a complete load of bollox. Why isn’t Arsenal going for Pierre-Emerick Aubameyang? The Fans in the Emirates will continue to pay match after match..
Wenger will continue remote control a fall. The Fans are just hard to die fans my sympathy as the Kronk is oops. Nice sunny day today. Really enjoyed it. Played football with my son and some other kids and enjoyed being amongst their untainted joy and enthusiasm for the game. It is a beautiful game. Still, it is only just a game all said and done. Tomorrow I’m going to have a barbecue and cook some nice marinated chicken. BTW did Arsene sign anyone yet? Perhaps…but at least we’re better looking!